The new Ducati Panigale V4 R is the ultimate road-legal Ducati race bike. Compared to the previous R version, the Panigale V4 R is even more specialized with modifications extending far beyond the engine and suspension set-up: for the first time they also include an Aero Pack designed directly by Ducati Corse in close collaboration with the Ducati Style Centre to improve on-track aerodynamic efficiency. 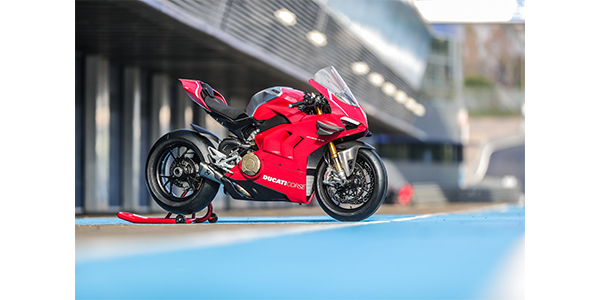 The Panigale V4 R is a road-legal WSBK category racing bike and constitutes the technical platform for the official Ducati Superbikes that will compete in the 2019 season. The new Panigale V4 R merges the essence of the Panigale V4 S with the specific changes requested by Ducati Corse to make it race-competitive. The 1,103 cm3 90° V4 engine has been replaced with the 998 cm3 Desmosedici Stradale R which brings it within the displacement limits established by WSBK championship rules. The bike features a new fairing incorporating wings elements of MotoGP origin. It also has race-grade Öhlins suspension with mechanical adjustment and an aluminum swingarm with an adjustable four-position axle. Moreover, the front frame has been modified to achieve the stiffness targets set by Ducati Corse. Sophisticated electronic controls borrowed from the Panigale V4 S now have revised threshold levels to make them more compatible with pro rider requirements. Unlike the 1,103 cm3 Desmosedici Stradale, designed to provide fluid power delivery and excellent low-rev pulling power for optimal road use, the 998 cm3 Desmosedici Stradale R version offers more extreme performance as power delivery has been designed with the track in mind. The Desmosedici Stradale R features lighter internal components and greater air intake efficiency: this allows faster engine rev-up and shifts the rpm red zone higher to improve acceleration. The result is 221 hp (162 kW) of power – which responds instantaneously to throttle movements – at 15,250 rpm (EU homologation values), 2,250 rpm higher than on the 1,103 cm3 V4. As in MotoGP, where all that matters is maximum performance, the Panigale V4 R features a dry clutch. This gives greatly improved feel during braking and through the corners, allows personalization of the degree of mechanical engine braking and is characterized by that iconic mechanical rumble which Ducati fans find irresistible. An eye-catching aerodynamics package requested by Ducati Corse includes screen, nose fairing and side fairings to reduce drag. It also features specially shaped air vents to reduce working temperatures during intense racing use. GP16-derived carbon fibre wings augment stability at all times, reducing electronic control intervention and boosting rider confidence, helping them keep the throttle open longer and brake later going into the corner. The suspension system has been optimized for track use. Both the steering damper and the Öhlins suspension mount mechanically adjustable top-drawer components. 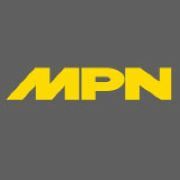 More specifically, the brand new pressurized NPX 25/30 front forks take as-standard Öhlins components to new heights. The rear TTX36 shock absorber completes the package.